How to educate college students to learn about basic finance? Motiv is a client project I’ve done in Interaction Design MFA program at the School of Visual Arts. I worked in a two teammates group to design a banking application for Northwestern Mutual, our client. Our clients concern was to help college students understand the basics of personal finance. Based on the research, 76% of millennials lack "basic" financial knowledge. Also, lot of statistics show how they struggle with their financial status. Interestingly, their lack of knowledge is not due to the lack of resources. What our team had found out was many college students do not have motivations to learn basic finance. What college students need is the awareness of how having a solid financial plan is tied to achieving their goals. Motiv shows college students how they can achieve their goals by adhering to a financial plan. We interviewed 5 college students, Financial advisors, and a banker from Chase bank to gain insights. Based on our interview, we wrote down intriguing facts from the interview, put them on the wall, clustered to the similar subject, and defined. Every day, college is the same. Same curriculum, same restaurants, same assignment, and so on. All they need to live is the monthly allowance they get from their family which leads them only to care about their monthly spending fees. They are afraid of asking for a consultation with financial institutions. Students think financial institutions are unwelcoming and strict. They prefer to take care of everything online and doesn’t prefer to go to financial institutes. Most of the college students have their aspirational lifestyle, not the financial plan related to it. Each of them has a desired lifestyle, but they don’t think that their goals are closely related to their financial plan. They are only focused on their dreams but do not have any plans or budgets in place to help them reach them. Based on our research, existing financial education sites follow the process of Inform, Educate, and convert. 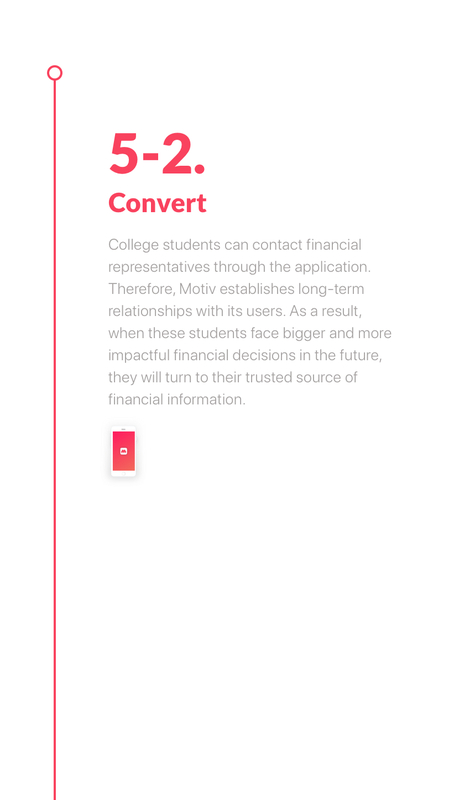 But Motiv focuses on intriguing and engaging students to introduce them to financial topics and gain a motivation to learn about basic finance. There are many ways that students may first engage with Motiv - but all lead to the Motiv application. How do the students get intrigued? What is the benefit for the financial institution? There are 17 million undergraduate students in the US. According to Granum law, for every ten contacts our financial representatives speak to, they will deliver three financial plans, one of which will convert into a paying client. Based on this number, if we also get 1% of current college students to join as customers, we would have 170,000 customers when we first launch. Motiv will help financial institutions add younger loyal customers by introducing them to the institute as a trustworthy and reliable partner. In the alpha phase, we will launch more than 10 colleges in states around New York. For the beta phase, we will launch in more than 50 colleges in higher education attainment states. On our version 1 status, we will broaden into more than 300 colleges over the US. Searching for solutions for you project? Let’s Talk!